Select the downspout where you want to place the barrel. Choose which port that you want to use for the spigot, either the lower port to use with a garden hose or the upper port 14″ above ground to use with a watering can. Attach the spigot to rain barrel. Place one of the washers on the end of the spigot and slide the spigot into the hole below the label. Reach into to barrel and place the second washer over the threaded end of the spigot. Thread the nut on the end of the spigot and hand tight. If you prefer to use the lower port, see Installation Tips below. Take the black L-shaped elbow (overflow fitting) and screw it into the pre-threaded hole on the top, right hand side, of the barrel. Remove the elbow and run-off pipe from the end of the downspout. If you are using a Save the Rain Diverter™ follow directions on diverter. Draw a line on the downspout 9” above the top of the barrel. Move the barrel away. Use a hacksaw and cut the downspout at t he line. Note: if a downspout bracket is below your cut, remove the bracket and place it above the cut. Squeeze or crimp the downspout end, so that the elbow will fit over it. Squeeze or crimp the downspout end so the elbow will fit over it. Attach the elbow to the downspout and move the barrel back against the house, so that the end of the elbow is over the center of the lid. 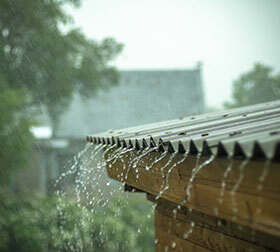 Rain water will now flow out of the elbow and down onto the cover of your rain barrel and drain into the barrel. Diverter InstallationTo install the diverter use either a hacksaw or metal scissors to cut a 9″ section out of your downspout with the lower cut being 2″ above the top of your barrel. Replace the section with the diverter. Use the tabs on each to hold the diverter in place. The downspout fits into the top end of the diverter and the bottom end of the diverter fits inside the lower section of the downspout. Use needle nose pliers to crimp the downspout to fit if necessary. SpigotThere is a choice of two ports to place the spigot. Placing the spigot in the lower port is ideal for using with a soaker hose or when the barrel is raised to increase pressure. The upper port is ideal to use with a watering can. Remember that the lid can always be removed to easily extract water by dunking your watering can into the barrel or by tipping the barrel forward when water falls below the spigot line. Spigot LocationIntuitively one might think the obvious place to put the spigot is at the bottom of the barrel. Think again, this may not be the most practical. Unless you raise the barrel significantly, you cannot place a watering can beneath it to fill if it is only a few inches off the ground. The lower spigot goes works well with a hose, however because barrels are gravity fed there will not be a lot of pressure. Lower placed spigots are ideal with a soaker hose, but once that is attached make sure you can still access your water supply to fill a watering can when needed. A barrel with a higher spigot allows you to use it with a watering can. When the water falls below the spigot level, tip the barrel towards you or remove the lid and dunk the watering can inside the barrel to access the water. Overflow Water Make sure the overflow valve or pipe in your water barrel is positioned or pointed away from your home’s foundation. Attach a 3/4″ inner diameter flex tube or hose to direct water away from your foundation. For conditions that require additional overflow use the 2nd overflow port. How to put spigot in the lower port. The best way to do this is to lay the barrel on its side on a table or bench to get it closer to waist height. If you have a partner who could help that would be ideal but if not proceed anyway. Place the spigot and one washer on the port and push the neck into the hole. Ask your pal to hold the spigot in place while you reach into the barrel and put the washer and nut onto the neck and hand tighten as much as possible. If there is no one to help, turn the barrel so the spigot is face down on the table, this will hold it in place while you reach in and tighten washer and nut onto the spigot neck. To insure a long life for your barrel clean it out occasionally to eliminate clogs and other debris from building up inside your barrel. Fine mesh screen should be used to cover any openings in the rain barrel to prevent mosquitoes and to trap debris. Winterizing your Rain BarrelIt is very important to winterize your barrel. Empty or drain your rain barrel and drain plug before storing for the winter. 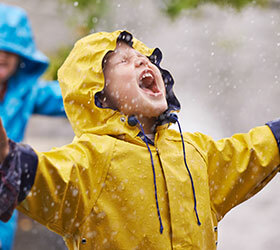 When possible, store your rain barrel in a protected indoor area. If the rain barrel must remain outside, either turn it upside down and secure it, or weight it down by storing garden equipment inside the barrel. Then put a heavy plastic bag over the top to prevent animal inhabitation and water accumulation which can freeze, expand, and potentially crack the barrel wall. To prevent ground saturation near your foundation, we recommend attaching a minimum of 6’ of 3/4″ hose to the overflow fitting and directing the water away from the foundation. If odor or insects become a problem Clorox is an age old remedy, use approximately ¼ cup to harmlessly disinfect the water. ICE IN BARREL can cause permanent damage and is not covered by the warranty. Please be sure to winterize your barrel.